West Ham ended their season with an away victory as they came from behind to beat Burnley at Turf Moor. Burnley went ahead when Sam Vokes scored his 10th league goal of the season when he finished off Andre Gray's low cross. The hosts' lead only lasted four minutes before Sofiane Feghouli netted to complete a fine move that also involved Edimilson Fernandes and Andre Ayew. 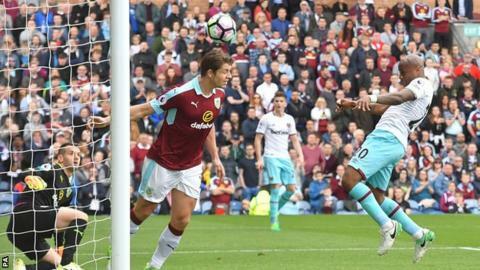 Ayew scored the winning goal with a close-range header after Tom Heaton had pushed Fernandes' shot on to the crossbar. The result means West Ham end the season in 11th place, missing out on a top-10 position on goal difference, while Burnley finish in 16th. Full credit should go to West Ham, who showed their fighting spirit to come back from a goal down to finish what has been a poor season on a high note. At Burnley, the Hammers were without the injured Mark Noble, Cheikhou Kouyate, Andy Carroll, Michail Antonio, Pedro Obiang, Diafra Sakho and Winston Reid, and could only name six substitutes on the bench out of a maximum of seven. Nevertheless, Slaven Bilic's side battled well with a depleted squad to ensure they finished the season on 45 points. However, the 2016-17 campaign will still be seen as a big disappointment for Hammers fans. The club came seventh last year and, with the club moving to the London Stadium, optimism was high that they could break into the top six. But that soon evaporated as only three points from the first six matches left them in the bottom three. They were in the relegation zone in December but a 2-2 draw at Liverpool and three successive wins ensured they would not drop lower than 15th again. A five-game unbeaten run in April and May, which included a memorable 1-0 win over second-placed Tottenham, ensured their five-season stay in the Premier League would be extended. Bilic is set to meet club co-owner David Sullivan early next week and the club's hierachy and fans will be expecting more next season. For Burnley, it was the opposite scenario with a poor end to a fine season. The Clarets were already guaranteed their best finish in English football since they came 10th in the old First Division in 1974-75 and this is the first time they have not made an instant return to the Championship after winning promotion to the Premier League the season before. There were hopes of a higher league finish after Vokes gave the hosts a deserved 23rd-minute lead, but his side quickly conceded an equaliser when Feghouli collected Ayew's flick to take West Ham level. Burnley were unlucky with what proved to be a winning goal as Heaton had made a fine save to deny Fernandes but the goalkeeper could do little as the ball fell to Ayew, who headed into an empty net from close range. Overall, for Sean Dyche's side to finish 16th has to be regarded as a success, but he will be clearly looking for less reliance on their home form in 2017-18. They picked up 33 out of their 40 points at Turf Moor, including wins over Liverpool and Everton and a home draw against future Premier League champions Chelsea. However, apart from a goalless draw at Manchester United, there was little for the travelling support to cheer. Their only away Premier League victory came with a 2-0 success at Crystal Palace on 29 April and only relegated Hull City with six points had a worse away record than the Clarets. Andre Ayew scored and assisted in the same Premier League game for the third time, and the first time while playing for West Ham. The Clarets have conceded exactly twice in their last three Premier League home games - but have not conceded more than that in the top-flight on home soil since January 2015 (2-3 vs Crystal Palace). Slaven Bilic's side picked up their first Premier League away win since February (3-1 vs Southampton) after a run of three draws and three defeats on the road. Sofiane Feghouli's goal was his first scored away from the London Stadium for West Ham in all competitions. West Ham have won their last five games against Burnley in all competitions. Sean Dyche's side have won just two of 16 league and cup games since the end of January, losing nine times. Burnley manager Sean Dyche: "This is a small negative in a positive season. The game should have been out of sight for us at half-time, we had enough chances but they were the better team in the second half. "The disappointment of today is tempered by the fact that we are still in the Premier League and that was always the aim. It is important we keep recruiting where we can and keep learning. "It is an obvious challenge to keep what we have got and we will wait to see if we can do that. We have got better year on year, that is not just the players it is the staff. Recruitment is a big thing, to keep moving forward and we will be able to do that. "It is a big achievement to stay in the Premier League and we have done that." West Ham manager Slaven Bilic said: "We wanted to finish positive and we deserved to beat them. It is always nice to win the last game and I'm really pleased for the guys. "We thought we were going to do better (this season), we had so many obstacles, so many injuries, so many surgeries, eight, which is not usual. "The move to the stadium, which is the best thing the club has ever done long-term, it took us a while to settle. You need time. It is very hard to get that Upton Park feeling but it is going to get better and better. "Today we showed character. We finished 11th and are one point from being eighth. It is not a season to talk about, to hail it, but it is not a very bad season. I'm expecting it to be better next season, of course. "The summer will be busy for every club. Today's game showed we have a quantity of players and a squad. We were without eight players and still we had a good team out. We need a few players to improve our first team. Make no mistake our targets are also the targets for eight to ten clubs in the Premier League." Match ends, Burnley 1, West Ham United 2. Second Half ends, Burnley 1, West Ham United 2. Corner, West Ham United. Conceded by Steven Defour. Attempt blocked. André Ayew (West Ham United) left footed shot from outside the box is blocked. Assisted by Manuel Lanzini. Corner, West Ham United. Conceded by Kevin Long. Substitution, West Ham United. Declan Rice replaces Edimilson Fernandes. Attempt missed. Edimilson Fernandes (West Ham United) right footed shot from outside the box is too high. Assisted by Aaron Cresswell. Johann Berg Gudmundsson (Burnley) is shown the yellow card for a bad foul. Sofiane Feghouli (West Ham United) wins a free kick on the left wing. James Collins (West Ham United) wins a free kick in the defensive half. Foul by Sofiane Feghouli (West Ham United). Substitution, West Ham United. Ashley Fletcher replaces Robert Snodgrass. Substitution, Burnley. Ashley Barnes replaces Andre Gray. Substitution, Burnley. Steven Defour replaces Ashley Westwood. Attempt missed. Sam Byram (West Ham United) right footed shot from outside the box misses to the left. Corner, West Ham United. Conceded by Matthew Lowton. Goal! Burnley 1, West Ham United 2. André Ayew (West Ham United) header from very close range to the high centre of the goal. Attempt saved. Edimilson Fernandes (West Ham United) right footed shot from the right side of the box is saved in the top right corner. Substitution, Burnley. Johann Berg Gudmundsson replaces Robbie Brady. Attempt missed. Ashley Westwood (Burnley) right footed shot from outside the box is too high. José Fonte (West Ham United) wins a free kick in the defensive half. Attempt blocked. José Fonte (West Ham United) right footed shot from outside the box is blocked. Assisted by Sofiane Feghouli.